Every educator and politician in America should read this book. Teachers Have It Easy is a landmark work examining how bad policy makes the teaching profession unsustainable. Interweaving teachers' voices from across the country with hard-hitting facts and figures, the book presents a clear-eyed view of the harsh realities of public school teaching. 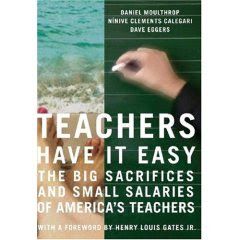 With a look at the problems of recruitment and retention, the myths of short workdays and endless summer vacations, the realities of the work week, and shocking examples of how society views America's teachers, Teachers Have It Easy explores some of the best ways to improve public education. Case studies demonstrate how current salary reforms are transforming schools, the lives of our teachers, and the educational experiences of our children.